Welcome to Carmichael Border Collies. We are owned by Heidi & Deb Allen Ducheneaux and the late Pete Carmichael. We are located at Timber Lake, SD. Timber Lake is located in north central SD west of the Missouri River on the Cheyenne River Indian Reservation and just south of the Standing Rock Indian Reservation. Heidi & Deb Allen Ducheneaux along with their children, Morgan, Brandt & Cole have taken the breeding over. In fact with the death of Pete the dogs you see here are owned by them. Heidi & Deb feel like they owe it to Pete's legacy to keep breeding the kinds of Border Collies that Pete loved & worked so many decades to produce. Starting in the 1960's until his death, Pete Carmichael raised Border Collies and we are continuing the breeding. 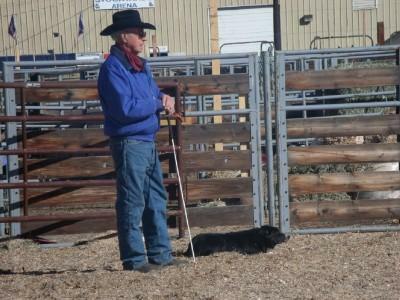 These bloodlines have everything running through them from Reserve National Champions in both cattle and sheep trials to high selling dogs 3 years in a row at the NWSS Cattledog Sale. Our bloodlines are time tested & proven for all types of needs, be it cattle or sheep working. They are also the type that will be your best friend when they aren't working. Please take confidence in our reputation and bloodlines that started in the 1960's.